War makes an easy introduction to card playing for kids without too many rules to complicate the game. Instructions: Deal out the cards and keep them face down. Player must not look at their cards. Both players turn over the top card in their piles and put them face-up in the centre. Whoever has turned over the higher ranking card, never mind which suit, picks up both cards and adds them to the bottom of his pile. Continue in the same way until two cards of the same value (eg two 4s) are turned over at the same time. This constitutes “War”. Both players then take two more cards and put one face-down on top of the card they have already placed in the middle, and one face-up. Whoever puts down the higher ranking face-up card wins all six. If, of course, two more same-ranking cards are put down, the state of “War” continues until there is a winner. The game is won by the player who manages to collect all the cards. War for Three: This is nearly the same as War (for two), except that the last card in the deck is not given out, to make sure that all the players have the same number of cards. Then, if two cards of the same rank are turned up, all three people have to go to “War”. 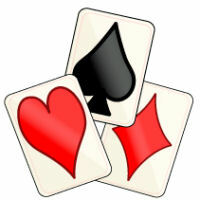 If, however, three cards of the same rank are turned up, the players play “Double War”, where everyone puts two cards face-down in the centre and one card face-up. If the cards happen to match, they continue with “Single War”.